Travel writing is a perfect fit for me. I was bitten by the travel bug in my twenties: I bought a school bus, converted it, and headed west to see the country. I’ve lived in a tipi at 8,500 feet with no running water or electricity, explored four continents, 26 countries, and dozens of beaches and islands. I’ve had incredible experiences, but I didn’t know what it would take to translate this to articles that would appeal to publications… and perhaps even earn me money and free travel. Getting started with something, especially something new, is often the hardest part. For over 20 years, I have worked as a coach in the real estate industry, helping people live lives they love while running businesses that thrive. We would start with their vision, and then support it with a business plan and activities. You would think that kind of background would have made it easy for me to get started as a travel writer, but I was uncertain where to start. I signed up for the Travel Writers Café and read the monthly assignments, but I didn’t put anything in motion. I researched. I read. I knew I had lots of great material. But I didn’t put any of it into marketable articles. I didn’t even understand how to submit a query. The overwhelming question of exactly what to do paralyzed me. The six-week course provided a structure and the support to move this from a dream to a reality. Each week, there was one (and just one) step to do. There was a video with Kyle guiding me through the week’s work, using an example that made it clear what steps I needed to take. By the end, I understood the elements of how to structure an article, how to write a query letter and to whom I should send it. When working on a goal, I enter specific days and times on my calendar when I will be working toward the result. Then I stick to them. For the Internship, I dedicated an hour a day for six days each week. The consistency allowed me to complete another step toward being a travel journalist. The great thing about time blocking is that it fits into however much free time you have. If an hour a day is too much, you can always scale back. But it keeps your goals in the forefront of your mind and helps you continue to work toward them. Today, my calendar is covered with writing time-blocks that keep me motivated. 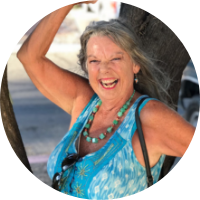 I have ordered business cards that say I’m a travel writer (or, more specifically, they say “hippie chick, baby boomer who likes to travel”). In addition, I’m slowly building a blog. The best part: After finally taking the leap, I’ve had one article published, and one more has been accepted for publication in December. I am feeling excited and confident. Getting started was the hardest part, but it was well worth going for it.